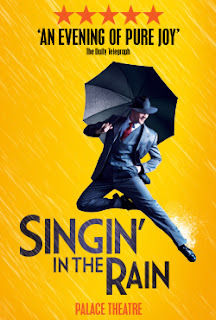 Last night Stu and I went to see Singin' In The Rain at The Palace Theatre in London's glitzy West End. Based on the 1952 Metro-Goldwyn-Mayer musical comedy film originally starring Gene Kelly, Donald O'Connor and Debbie Reynolds it offers a comic depiction of Hollywood, and its transition from silent films to talking pictures. This West End version is an almost scene for scene conversion to the stage starring Adam Cooper, Daniel Crossley and Scarlett Strallen. The show is very funny - but no funnier than the film. The singing is really good - but not really outstanding. No, it's the dancing that makes this show excel. The lead performers and ensemble really come into their own with the dance routines. The production is put on with such joy and with such a spring in it's step you can't help but want to jump up and dance yourself. You don't of course because that would be stupid but you have a good time anyway humming the songs, clapping your hands and tapping your feet. Yes, folks it's that sort of unadulterated fun show. And every show needs it's stand out moment and this show is no different. The show stopper is, as might be expected, the title song Singin' In The Rain. 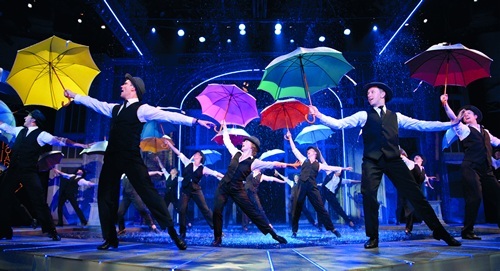 Water pours down from above onto the stage and Adam Cooper dances, spins his umbrella and splashes about in the rising water just like in the film. Magic. The first four rows got rather wet - but then that what they came for. A big splash. My favourite two scenes both starred Katherine Kingsley playing evil actress Lina Lamont. Phoebe Dinsmore: [giving Lina diction lessons] Repeat after me - Tah, Tey, Tee, Toe, Too. Lina Lamont: Tah, Tey, Tye, Tow, Tyo. Lina Lamont: And I cayn't stand'im. Phoebe Dinsmore: And I can't stand him. Lina Lamont: "People"? I ain't "people." I am a - "a shimmering, glowing star in the cinema firmament." Lina Lamont: It says so - right here!